Delta Mule was Grand Eagle before that. Today it’s better known around the sixth boro as Eastern Dawn. 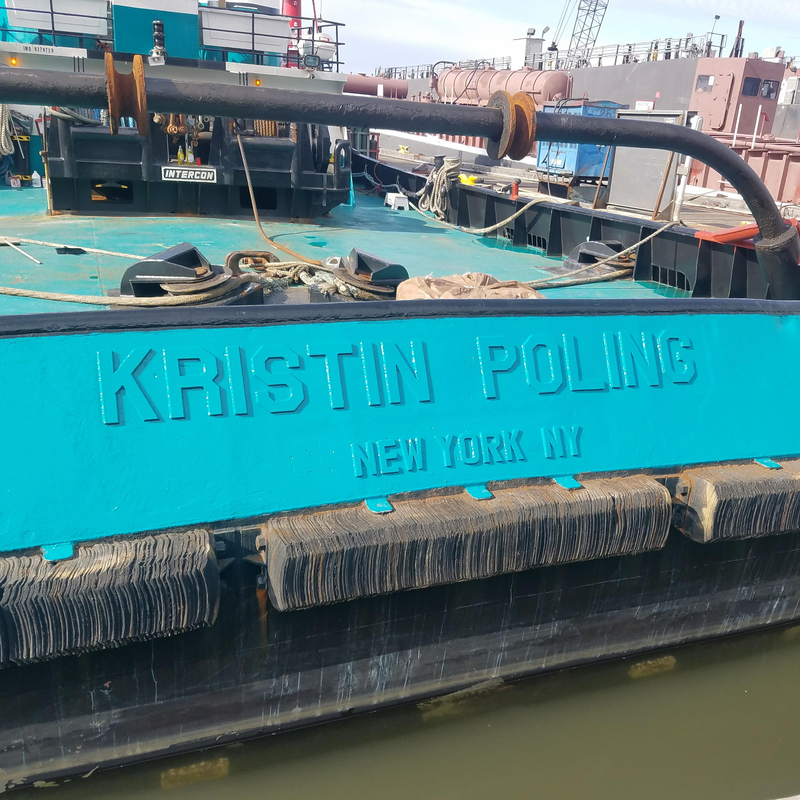 Sea Ox was the second name of this vessel, after Lief S. Since Inland Sea it moved on to Brooklyn and now is known as Charlotte V. If raised letters were changed each time, all that heat would make for enough of a ceremony, a necessary requirement to avoid Poseidon’s penalty. Thanks to Lisa Kolibabek, here’s a view of the step by step erasure and replacement, which reminds me of tattoo removal. Chesapeake needs to come off along with the place of registry before Kristin Poling comes on. 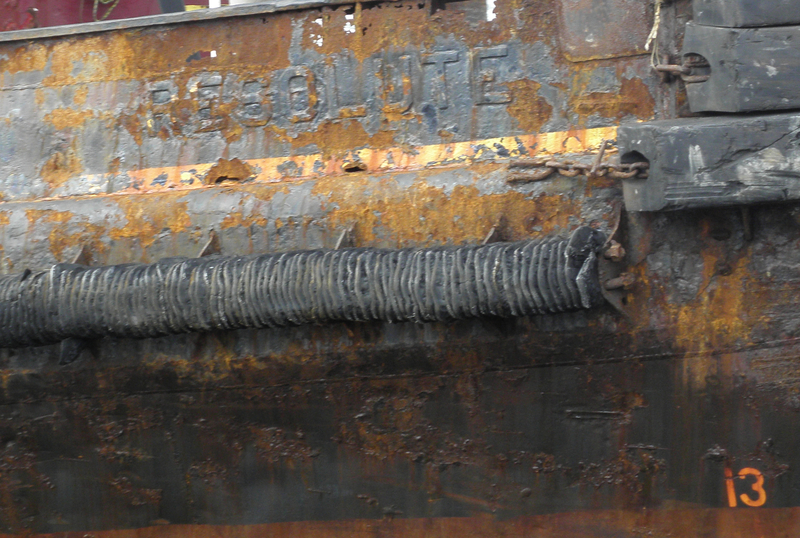 The final result looks shipyard-launch new. 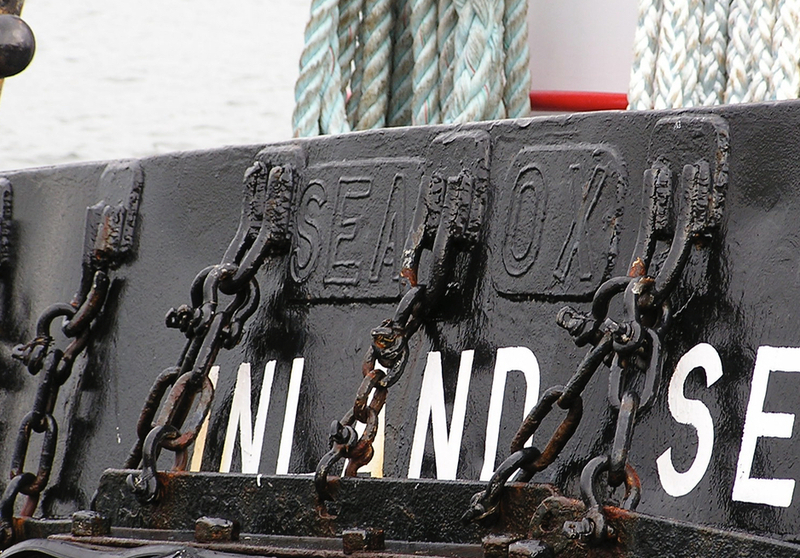 Some tired old vessels might beg for a renaming in steel; Resolute today is called Ocean King. This one puzzles me, because I found that the current ARC Patriot used to be Aida. Why the F and the O, Fidelio? 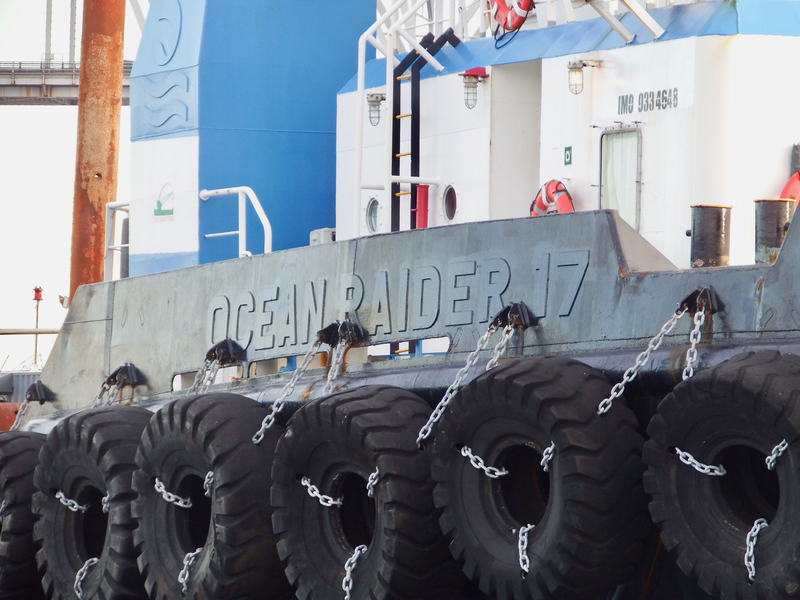 in raised letters, she was Ocean Raider 17. Anyone know what she’s doing it the bro? Was she US built? 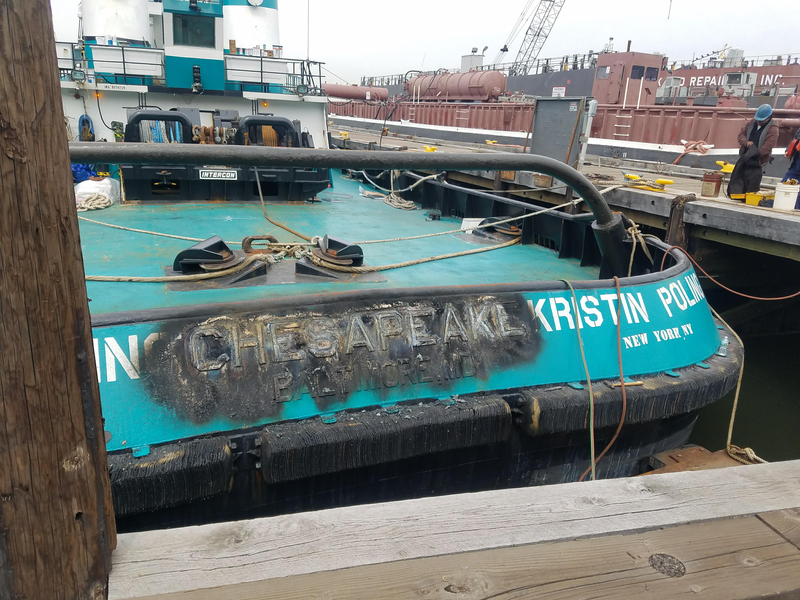 Thanks to Lisa for the photos of Chesapeake–Kristin Poling. All others by Will Van Dorp. 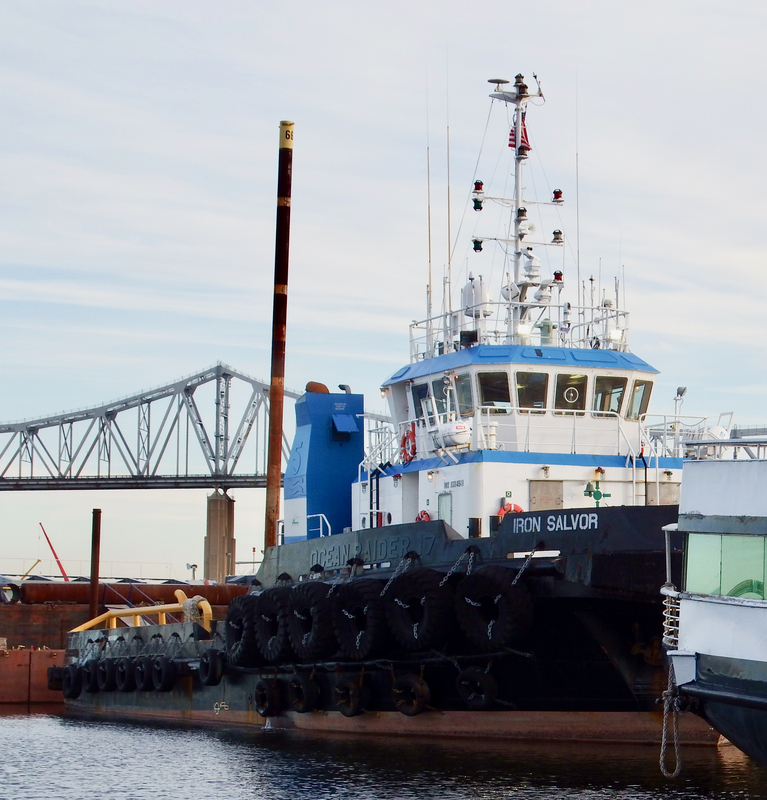 Iron Salvor was Ocean Raider 17, built 2004 by PT Batamec at Batam, Indonesia, hull number 7006. It has made the difficult transition from Indonesian to Mexican to American to Mexican to American registry. 34m x 10.4 x 5; 394 gt, 119 nt; twin Caterpillar 3516Bs. 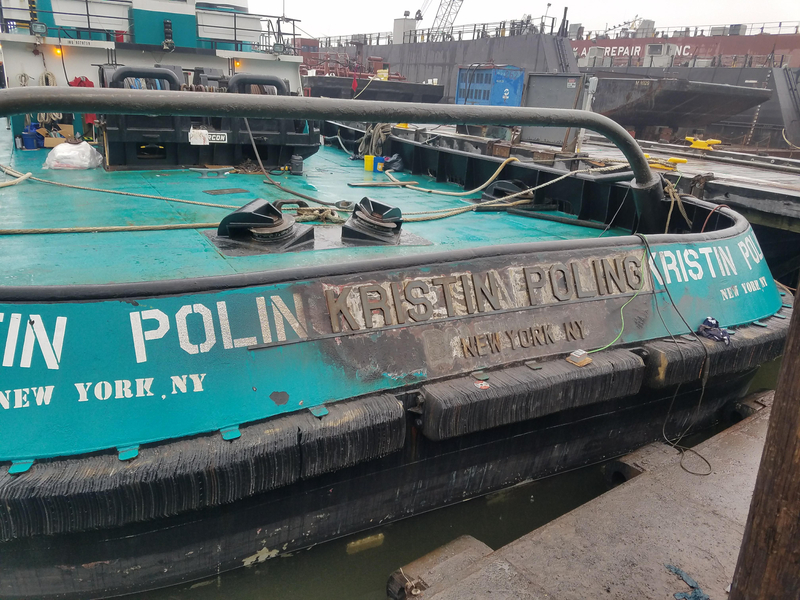 It is now owned by Wittich Bros. Marine, Inc., Matasquan, New Jersey. I assume it has gotten around the Jones Act by not being intended to carry goods or passengers in coastwise service, but who knows. The Patriot lettering (which could also be Figaro, given Olaf Wallenius’s penchant for opera names) is a complete mystery. 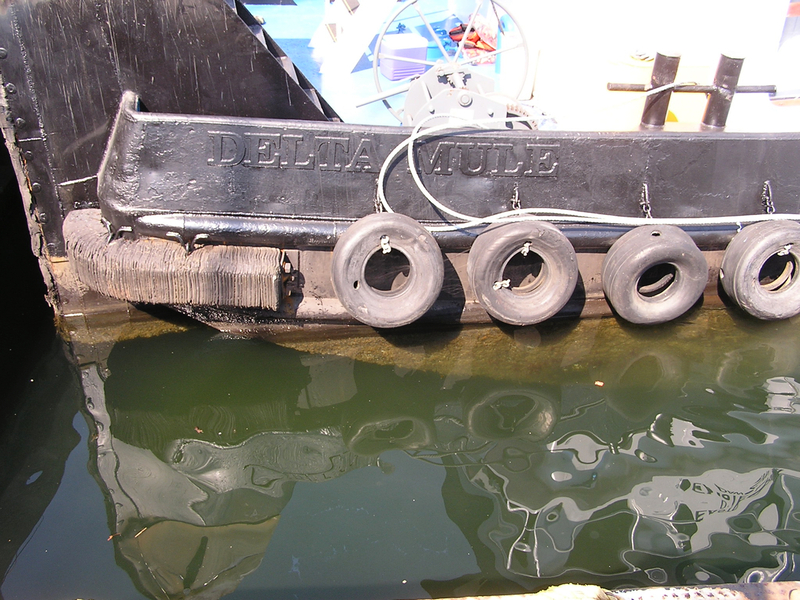 The only option is if the PATRIOT in your photo is an earlier one, ON 1000318/IMO 8602775. She was built in 1987, became FIDELIO in 1994, PATRIOT in 2002 under U.S. flag, MORNING MARVEL in 2012 under South Korean flag, and was scrapped in 2016. William and George– Thx. That photo was from 2010 or 11. Yep. 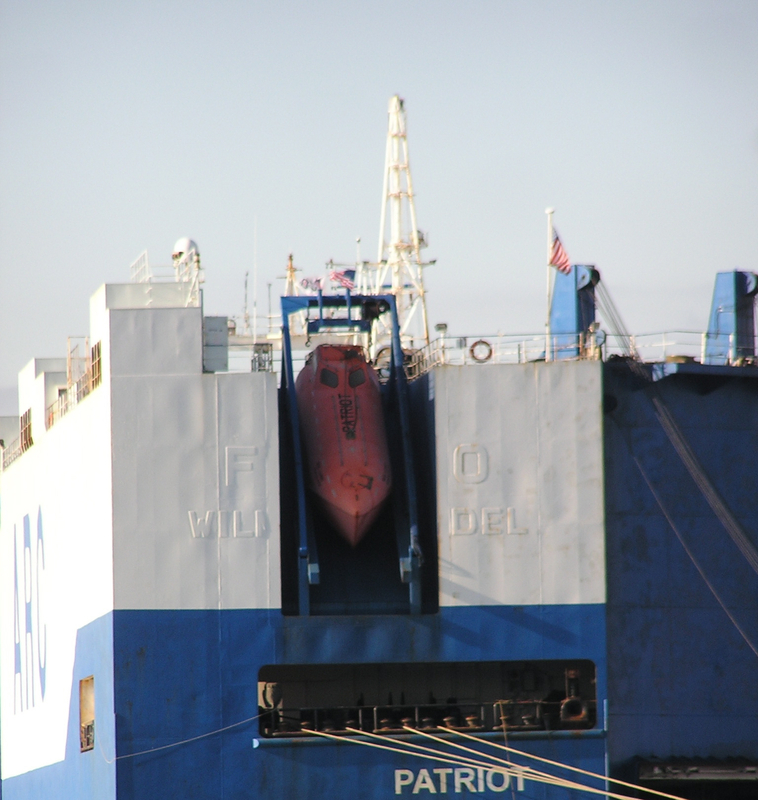 The Patriot was owned by Interocean American Shipping Corporation of Voorhees, New Jersey, that registered the 1987 vessel at Wilmington in 2008 as one of the eight reflagged car carriers the firm operated as part of the MarAd Maritime Security Program. It left American documentation in October 2012 when it entered South Korean registry. It was broken up at Aliaga in 2016. « Join the Canal Society?